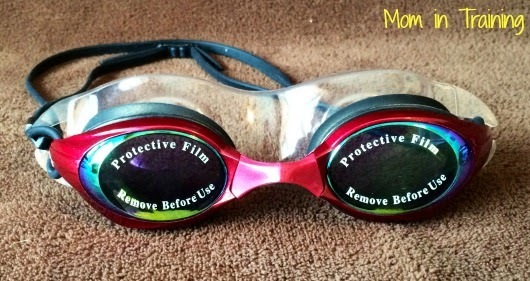 If you've ever been swimming and had your goggles fog up on you then you know what a pain that can be. We've purchased many different brands of goggles at our local department stores with no luck of any of them being better and keeping the fog out. Thankfully these goggles are different from the rest. They feature fog-resistant poly-carbonate lens and soft silicone that helps them seal tight. You don't have to over tighten them to make them seal, just until they are comfortable. My son has been using these during swimming class at school and said he really likes them. He can go under the water and see with no problems. Now we just have to wait for summer so we can all try them out in our own pool! Bonus earplugs (with every pair) keep water out of your ear canals for a more enjoyable swim. Soft silicone provides a comfortable seal that lasts; no more stinging pool chemicals to blur your vision. Fog-resistant poly-carbonate lens provides exceptional clarity whether under water or above, in any temperature both indoors and out. Comes in four vibrant colors - add a little fun to your swimwear collection, or get one to match every mood. Fully adjustable, dual head strap keeps goggles firmly in place during heated competitions as well as leisurely swimming. These sound like a dream. I wonder do they pull at long hair when there on? That would be my only wonder.